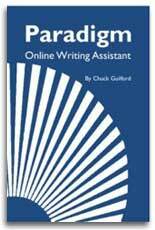 The same award-winning content that has made Paradigm an Internet classic is now available in this quality paperback edition. This writer's guide and handbook accompanies the popular website, www.powa.org. It offers strategies for mastering the writing process process, including help with discovering, organizing, revising, and editing your writing. It also has chapters on thesis/support essays, informal essays, exploratory essays and argumentative essays. In addition, the book offers a clear, concise discussion of how to use MLA documentation. 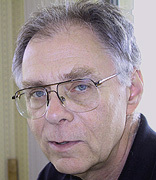 Chuck Guilford is an emeritus English professor at Boise State University, where he taught literature and creative writing for 23 years and founded BSU’s Idaho Writers Archive. He is the creator of two writing websites, Paradigm Online Writing Assistant and poetryexpress.org. His poems, short stories, essays, and reviews have appeared in a number of magazines and anthologies, including Poetry, Kansas Quarterly, Coyote’s Journal, College English, Weber Studies, Redneck Review of Literature, Crab Creek Review, Inland, and many other magazines and literary journals. He is also a winner of the Western Literature Association's Willa Cather Memorial Award (the Willa Pilla).What Counts, a chapbook collection of his poems, is available from Limberlost Press.